Keith Donnelly: I am based as East Kilbride Art Centre. What I am going to talk to you about is Visual Arts residencies, but in this case a sequence of residencies that we have run over the past two years from 2005 to 2006. 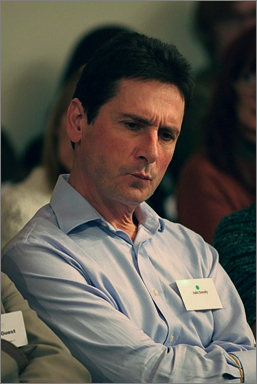 The context of these; the first in 2005 – RESONATE followed by a SAC Partners funded programme in 2006 – ‘RESUME’. In each we gave the artists an outline brief to explore visual arts research through community and educational engagement and concluding with exhibition. In the first year we had eight participating artists who linked with project partners such as the National Health Service, The David Livingstone Centre through the National Trust for Scotland and the Museums Councils; each contributing to the funding of their own project artist. Each artist had one month to look at these variables, as it were. The concept of ‘RESUME’ was to look beyond the period of one month and to look at the seeds that the artist had sown to see if we could develop that in different ways. That is what we did with a number of artists. I have chosen as a case study this evening, Sylvia Grace Borda. Sylvia, would you mind standing up? Sylvia has kindly come all the way form Canada but currently works at Queens University in Belfast as a visiting lecturer. 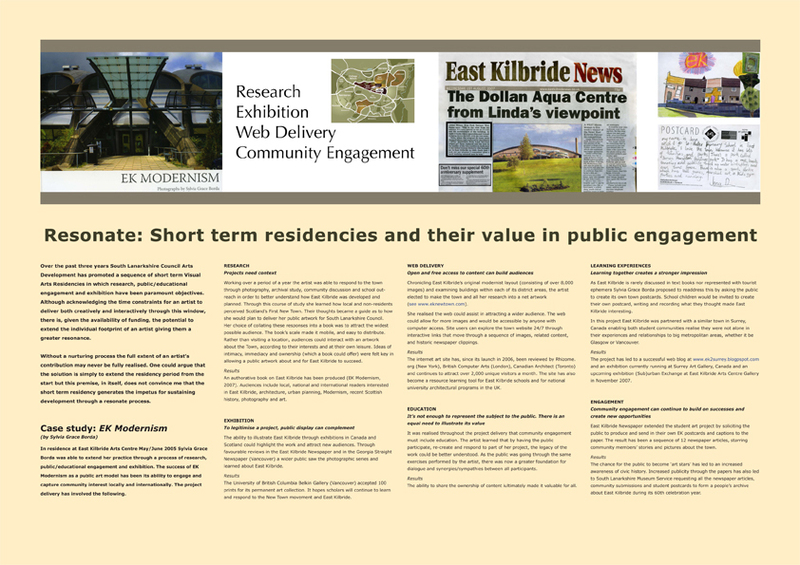 The context of Sylvia’s residency: she was actually based at East Kilbride Arts Centre and initially she looked at the towns ’roundabouts’ as a focus. She had previously worked in Surrey, a city outside of Vancouver, Canada, looking at ‘every bus stop in Surrey’. She started by looking at the concept of every roundabout in East Kilbride as the town is known as Polomint City. After initial research she started to look at Modernist architecture in East Kilbride – this came about through a conversation that we had about education and the plight of the Modernist building. I think, through the programme of school modernisation in East Kilbride, we are now looking at the redevelopment of every single high school in the town including Sir Basil Spence’s Duncanrig High School. Sylvia made extensive use of the Royal Commission on Ancient and Historic Monuments Scotland and contacted libraries and archives. Sylvia did a snapshot for a month, and on the basis of this we were able to extend the project through the Urban Cultural Programme which was funded through the Millennium Commission. In the second phase she had a slightly different brief. She had to look at the town centre park in East Kilbride and used that as a footprint to extend her research. She was able to uncover that, not only were very significant sums of money spent on schools by the Civic Corporation (that is East Kilbride Development Corporation), but also that the school facilities for young people equalled almost the size of a park – so you had the size of a park, as it were, in a leisure and sports context within the schools. From this investigation of the schools she gravitated into looking more directly at the loss of the Modernist architectural structures. She researched the archives (the photographic records that Sylvia has amass amount to about 8,000 photographic images; an archive in itself) and her photographs are probably now the only official record of those schools. I think, through an arts process, we have been able to register the unique Modernist architectural heritage of East Kilbride. However, I want to turn to the board here because, again, through Sylvia’s work, she was able to extend her research into an exhibition and also a website. The website was reviewed internationally: by rhizome.org in New York; Canadian Architecture, Toronto and by British Computer Art, London. I want to quickly skip onto our current endeavour which is a development of the project. We are working with Enver Creek, a senior school in Surrey, Canada, and schools in East Kilbride. We actually have an exhibition currently in Surrey which started two weeks ago and we have a photo drawing exhibition ourselves in November. That is really looking at a mirror image – it is extending the work of the photographer; allowing both adults and young people to look through the eyes of the artist. The initial artist’s research is opened out to the community through the exhibition, web site and even the local newspaper, the East Kilbride News.